The Wire February 711 doesnt always visit GTMOStory and photos by Spc. 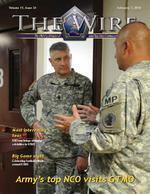 Lerone Simmons Staff Writer, thewire@jtfgtmo.southcom.mil They dont always visit U.S. Naval Station Guantanamo Bay, but when the USO does a tour, it brings Jonathan Goldsmith, Dos Equis most interesting man, and Phil Heath, Mr. Olympia, for a handshake tour. The duo signed autographs and conducted meet-and-greets with base residents and Joint Task Force Guantanamo Troopers Feb. 1, at the Naval Exchange, Seaside Galley and Bayview. Our reception here has been amazing, said Goldsmith. This character brings a lot of attention. An actor of more than 50 years, Goldsmiths Dos Equis character is one he says people aim to relate with. He described success as something you work hard for, and must be interested in achieving. To be interesting you have to be interested, he said. Army Sgt. 1st Class Aaron Hiler, JTF Public Affairs Webmaster and graphics editor was one such fan who was excited to meet Goldsmith. He brought his his cigar humidor for Goldsmith to sign. I was glad to meet Mr. Goldsmith and Mr. Heath. It turns out that they both enjoy smoking cigars and I was able to offer them a couple from my own collection, said Hiler. They were both thrilled to receive my gifts. Both Goldsmith and Heath said they were glad to give back to the Troopers on this USO tour. Im here for the troops, said Heath. Ive always been a fan of Service members and what they do, so what better way to pay homage to them than to come down and pay tribute. Heath is the current Mr. Olympia, a title bestowed to the winner of the professional mens bodybuilding international contest held by the International Federation of Bodybuilding and Fitness. 12http://www.jtfgtmo.southcom.mil/xwebsite/index.html Troopers assigned to Joint Task Force Guantanamo and U.S. Naval Station Guantanamo Bay tuned in Super Bowl 48, many among friends, family, or within the confines of their individual rooms, Feb. 2. For many Troopers, this served as a break from their busy workweek, and gave them a chance to socialize. It also served as a reminder of the reality of being deployed rather than their usual home settings. Back home, we usually chose a residence, whether ours or a friends, create a menu, and let everything play out, said Air Force Tech. Sgt. Lakesha Cole, noncommissioned officer in charge of JTF GTMO manpower. It usually ends up being a large group of friends having a good time. This year, Cole celebrated with new friends at the Cuzco barracks, watching the game outside. Though she said shes not a huge fan of the game itself, she tuned in for the commercials and the halftime show; a benefit of having subscribed to cable. I loved the puppy and horse commercial, it pulled at my heart strings. Tim Tebow didnt disappoint either, proving he could do everything, including saving the world, she said, referencing two popular Super Bowl advertisements. American Forces Network, a free television network for Service members worldwide, broadcasts numerous sporting events, but has its own local Public Service Announcements that take the place of typical Super Bowl commercials. Air Force Senior Airman Joseph Graeff, a structural engineer assigned to the Base Engineer Emergency Force, watched the game on AFN with his peers, ordered pizza, and hoped to see the commercials. It wouldve been great to see the commercials, but the game was well worth watching, he said. This isnt the first time Marine Sgt. Derrick Wyatt, assistant operations chief assigned to the Marine Security Forces Company, U.S. NAVSTA GTMO, has deployed during the big game. In 2008, he viewed the Super Bowl from Iraq. In 2007 we were in a remote location of Iraq and werent able to see the game. So instead, we played each other and had our own Super Bowl, he said. In 2008, we were able to see one quarter of the game, then had to continue our operation. This year Wyatt had a party at his home on base, among friends and family, and watched the entire game on cable. Its great to just be able to watch the game, he said. Thankfully, we have the opportunity to see it here. Photo by Spc. Lerone Simmons/The Wire Courtesy photo Story by Spc. Lerone Simmons Staff Writer, thewire@jtfgtmo.southcom.mil ?